Launch Photo Slideshow Director HD on your iPhone or iPod and create a slideshow project. Making slideshows begins with selecting photos. In the main screen of Photo Slideshow Director HD, tap Photo tab to bring up Albums window. At this time, a window will pop up, asking you if you want to Photo Slideshow Director to access to your iPhone photos. Remember to choose Allow. Then all your albums in iPhone Photo Library will be listed. Tap albums to view photos and tap photos to import them. Also you can take instant photos and use them in a slideshow. Photo Slideshow Director HD enables you to select photos from Facebook albums, Flickr albums, Picasa albums, Dropbox albums, SkyDrive albums and Instagram. 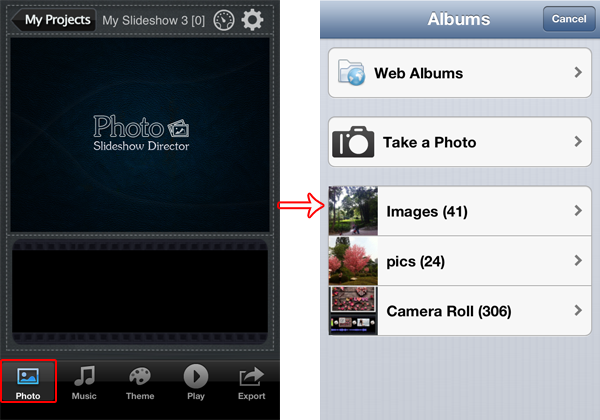 You can create a slideshow with photos from different sources without downloading them to iPhone / iPod. To add photos from web albums, you just need to sign in your accounts. 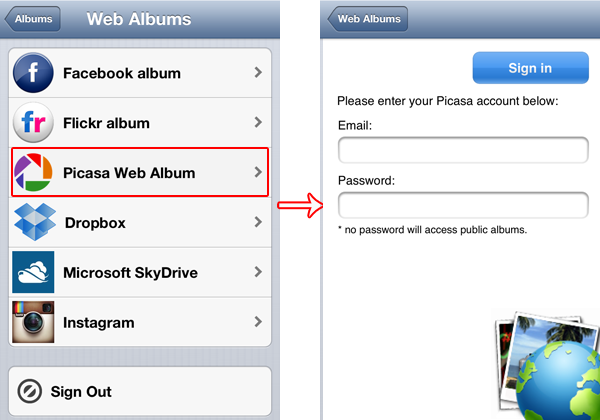 For example, if you want to use photos from Picasa web albums, tap Picasa Web Album, the login screen will show up, asking you to enter your Picasa account information. Type in account information, then tap Sign in, you will see all your Picasa albums listed. Choose albums and tap photos to add. You can import photos from other web albums in the same way.